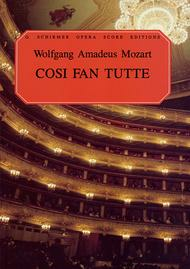 Cosi Fan Tutte, (K.588) (Vocal Score). Composed by Wolfgang Amadeus Mozart (1756-1791). Edited by Thomas Martin and Ruth Thomas Martin. Arranged by Ruth & Thomas Martin. For Piano, Vocal (Vocal Score). Choral. Classical Period and Opera. Vocal score. Piano reduction. 370 pages. G. Schirmer #ED2038. Published by G. Schirmer (HL.50337770).ISBN 0793511763. With piano reduction. Classical Period and Opera. 7.5x10.7 inches.Italian/English. Translated by Martin.